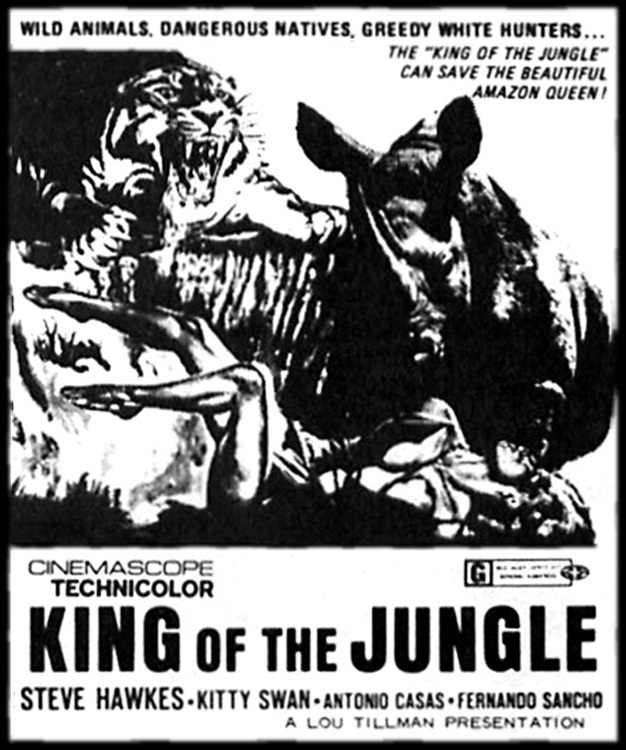 ZAN, KING OF THE JUNGLE [Tarzán en la Gruta del Oro] (1969; Video Screams). Steve Hawkes is best known as the star, co-writer and co-director of the anti-drug, pro-Christian, turkey-headed-killer horror film BLOOD FREAK (or, if you live near Boca Raton, for when Steve's 600-pound Bengal tiger escaped from his makeshift animal sanctuary in 2004). 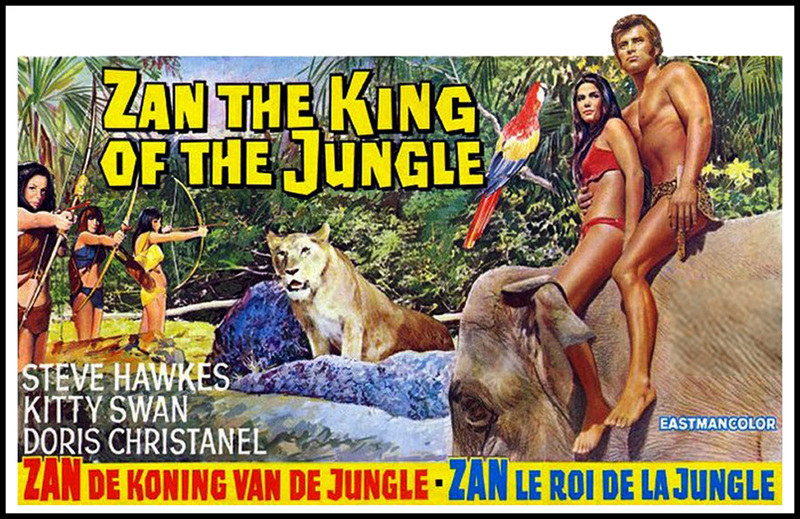 But before that cult-fave gig, Croatian-born Hawkes headed up two cut-rate, braindead Tarzan knock-offs by Spanish director Manuel Caño (THE SWAMP OF THE RAVENS), with the jungleman's name shortened to Zan, since the producers couldn't afford the Tarzan licensing fees. This, the first of the pair, was shot in the jungles of South America and the Florida swampland, and while Hawkes had the necessary physique and loin cloth, his '60s sideburns, '50s pompadour, wobbly yell, and all-around lousy acting made him an easy laughing stock... When sultry, scantily-clad white chick Irula (Kitty Swan, star of Ruggero Deodato's GUNGALA, THE BLACK PANTHER GIRL) is seized by an African tribe in the opening minutes, who can save her? Muy macho Zan, of course, who rides to her rescue on an elephant, takes on her captors singlehandedly and returns this beauty to her hidden Amazon village. Soon afterward, Zan is shot by greedy, evil white hunters who're after the Amazons' "yellow stones" (i.e. gold), but it takes more than a bullet to put down our studly savage. After a hard-drinking old prospector patches his wound, shortsighted Zan rewards him with gold stolen from the Amazons' secret grotto, which quickly catches the attention of our stock villains. Meanwhile, Krista Nell (FEAST OF SATAN) plays the prospector's gorgeous daughter, who's new in town and shocked by local customs (e.g. finding a eight-foot snake in her hotel room, the chief of police wandering in while she's bathing). After Irula becomes the new Amazon Queen, their home turf is attacked, her sisters are all slaughtered and it's up to Zan (who's essentially responsible for this massacre in the first place, by revealing the location of their gold) to save the day... The production boasts scenic nature photography and comely actresses (both underscored by this colorful, widescreen, English-language print, with opening credits that identify Steve as "El Halcon Blanco," a.k.a. The White Hawk), but it's still a ridiculously cheap, often excruciatingly dull mess. The script by Santiago Moncada and Joaquin Romero Hernandez (who also teamed up for CUT-THROATS NINE) is littered with meatheaded characters and comic relief -- from absurd (Zan gets poker-playing advice from his talkative pet parrot), to idiotic (caged Zan wrestling a guy in a ratty-assed, matted gorilla costume), to purely unintentional (Zan subduing a pathetically-sedated cheetah) -- while its most enduring achievement is offering definitive proof that Steve Hawkes was the worst Tarzan to ever grace the silver screen (and yes, that includes Casper Van Dien, Miles O'Keeffe and even Taylor Mead in Andy Warhol's TARZAN AND JANE REGAINED... SORT OF).